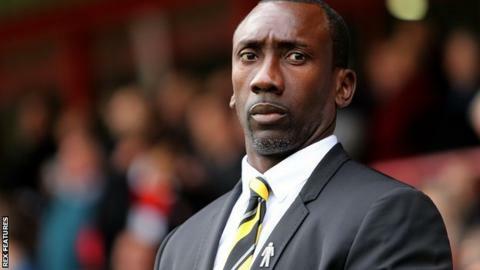 Burton Albion boss Jimmy Floyd Hasselbaink believes none of the Football League teams should play during international breaks. The Brewers have had their 14 November game with Millwall postponed because the Lions are expected to have three players called up by national teams. "If the big teams stop, then we should all stop," he told BBC Radio Derby. "The Premier League and the Championship are all stopping, so make us part of that as well." Burton would have been without Luxembourg international Aurelien Joachim had the game gone ahead as planned. Former Netherlands striker Hasselbaink, whose side are currently second in League One, believes that postponing games throughout the Football League would ensure a level playing field. "If everybody has the same and plays the same games at the same time then it is fair," he said. "There are enough Tuesdays for us to play the matches." Read more on Gymnast Max Whitlock: From house-bound to household name?